Gold was never known to occur in significant quantities in Illinois. It has never been mined on any large scale in the state, not even as a byproduct of various types of mining (sand and gravel, zinc-lead, fluorite, etc.). Gold prospecting opportunities area still possible on a smaller-scale. 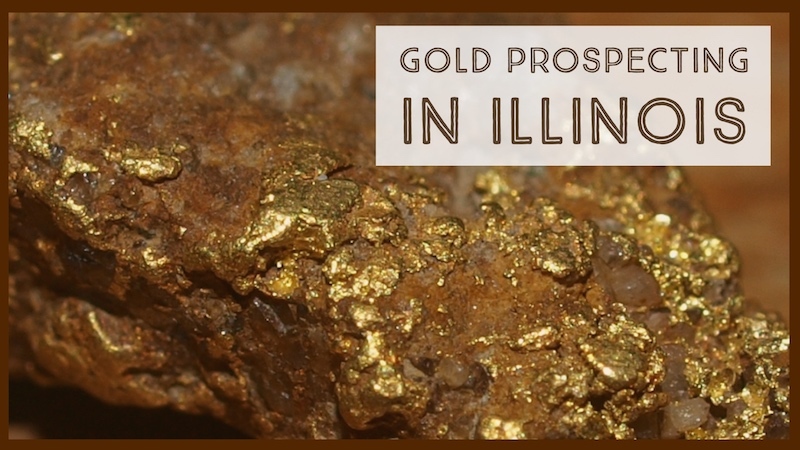 Like the rest of its neighboring states, Illinois has been fortunate to have some limited amounts of placer gold deposits in the form of previous glacial drifts that occurred thousands of years ago. A few early recorded reports of gold that was discovered in certain bedrocks of the state that lent credibility to the yellow metal’s existence in Illinois. Further exploration has confirmed that fine gold can be located in may parts of Illinois. In 1899, in a zinc mine in Stephenson County, southeast of the Upper Mississippi Valley Zinc-Lead District small amounts of gold were reportedly found in a couple of samples of quartz nodules. A 1975 local newspaper story reported minor amounts of gold retrieved from an old shaft that was initially mining for the dolomite mineral in Bald Knob, a large hill in Alto Pass Village in Union County in 1900. Furthermore, according to a 1978 Illinois Geological Survey Letter, all of the other reported occurrences of gold in the state of Illinois came from unconsolidated or scattered surficial deposits: ores that contained trace amounts of gold; small amounts of gold found through panning heavy minerals from sand and gravel deposits; or, in glacial debris that have been transmitted southwards from areas of gold-bearing bedrock in Canada and deposited throughout Illinois during the Pleistocene or Ice Age. Almost all of these gold occurrences appeared to be in alluvial deposits— either glacial outwash or modern stream gravel deposits— derived from glacial elements. Out of these particular reported discoveries, there were neither discernable patterns nor specific areas within the glaciated portion of the state where gold has occurred. In Cumberland County, gold was retrieved from creek gravels near the town of Greenup. In Fulton County, fine gold existed in the Illinois River and Spoon Rivers. In Ford County, small amounts of gold were found in the Vermilion River nearing the boundary with Vermilion County. In Henderson County, gold existed in the Mississippi River Valley and along its small tributary. In Jackson County, an unpublished 1968 report from the Illinois State Geological Survey described gold occurrences in the boulders of a field near Carbondale City that were once assayed at $25 per ton. In Jasper County, placer gold was reportedly present in the Embarrass River. In Lake County, an old-timer well driller reported to have witnessed gold in a well’s sand bed. 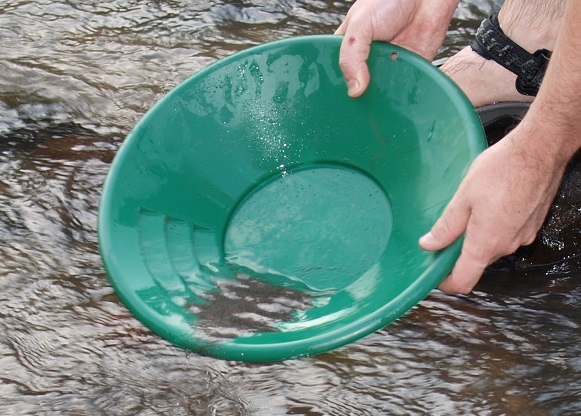 In Lee County, many people have reported to have seen gold panned from the gravels of Rock River. In Macon County, small quantities of gold were obtained in the Sangamon River and its tributaries. In McHenry County, gold was taken from an outwash plain that can be found within the county. In Peoria County, gold was recovered at depth in the sands of a well near Peoria. In Wabash County, fine gold occurred in the Wabash River and its tributaries. In Will County, samples of glacial outwash near Channahon contain some gold. In Winnebago County, samples of sand from a well in Rockford City had gold deposits. As previously mentioned, the gold occurrences in Illinois were primarily only limited to glacial deposits. Generally, these were never rich enough for any profitable commercial mining venture. While recreational prospectors and miners may have success, or failure, in the particular areas cited, there is potential for gold in any stream within the region of the glacial drift occurrence. In summary, panning trace amounts of gold is certainly possible in certain locations in Illinois, especially in glacial outwash deposits and along streams that incised into the glacial drifts. With limited quantities, be sure to explore many areas.